Explore your world and discover its amazing animals Discover the thrill of going face-to-face with wild animals as you explore fascinating habitats filled with untamed adventure. Become an official animal expert by identifying and collecting photos of over 40 amazing animals. Along the way, help a squid escape from poisonous fish, chase zebras safely away from hungry predators, sWing through the jungle with the Titi monkeys, and much more! Jump Start Artist gives your child the tools to discover and explore the world of art. Kids create their own masterpieces using many exclusive design tools. By playing games, your child will discover famous artists, artworks, and art styles while learning the basic principles of art, including lines and shapes, primary and secondary colors, textures and patterns, symmetry, value, and other important art concepts. You’ll make history as you blaze the trails with the world’s great explorers. Jump right into the adventure as you travel back in time and team up with courageous explorers to reveal the secrets of newly discovered worlds. Five history-making expeditions in all. for young children, Jump Start® Languages offers a simple, age-appropriate introduction to languages. Through fun activities and songs Jump Start® Phonics Read & Rhyme encourages your children to become confident readers by introducing, teaching, and reinforcing the basic building blocks of reading. Step-By-Step Approach: Children master each new word and sound as they progress through engaging activities. The most fun your child will ever have while learning to spell! Give your child a head start on spelling success with Jump Start® Spelling! Your kids will learn important spelling skills as they play fast-paced arcade-style games in this prehistoric world of dinosaurs and cavemen. Help CJ save his firefly friend Edison from some not-so-bright cavemen! How do you get your child to study for spelling tests? Make it into a game! With Jump Start Study Helpers your child simply enters his weekly spelling wordsinto the computer and starts playing. With arcade-style activitiesplaying the games means your child is practicing the words and improving theirtest scores! Designed specifically for kids, Jump Start Typing combines our award-Winning learning system with exciting game play to make learning to type fun and easy. Children become accomplished typists while being entertained and engaged in four extreme sporting events including rock climbing, skateboarding, soccer and snowboarding. Jump Start® helps toddlers explore fundamental concepts from numbers and letters to colors and shapes, matching, pre-reading, pre-math, and much more! It builds confidence and curiosity through discovery. Experts have identified seven learning styles--some kids respond best to songs, some to pictures, and others to words and rhymes. Because kids learn in so many ways, Jump Start® uses all seven learning styles. Leap to an early understanding of letters, numbers, shapes and colors in a colorful classroom bursting with songs and animation! Packed with more learning activities than most other educational programs, Jump Start® Preschool has 10 irresistible interactive puzzles, games and play areas. Kids build essential Kindergarten skills and get a head start on 1st Grade with the help of fun animal friends, music, and animation! Master key skills in Math, Reading, Science, Spelling, and more! Kids build essential 1st Grade skills and get a head start on 2nd Grade with the help of fun animal friends, music, and animation! Master key skills in Math, Reading, Science, Spelling, and more! Frankie's circus pals have been trapped in a magical jigsaw puzzle by mischievous Mel the Magician and they need your help! Play exciting carnival games and build a solid reading foundation with 7 skill-building activities, 6 phonics practice activities, over 1,500 vocabulary words, a parent's progress report, and more! 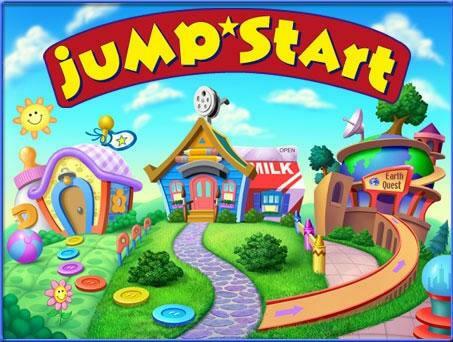 Want To Tell A Friend About Our Jump Start Software Games!